Woo-hoo! Last day on the road (until next week :)) AND a Summer Short & Sweet Day! ANYway, are you ready to be Short & Sweet? Pick a letter – any letter! – the first letter of your name, a letter you like the shape of, a letter you like the sound of – any letter! Now, pick a name that starts with that letter. This will be your character. Now, write us 50 – 100 words (more if you like, but 50 – 100 will do :)) of a story about this character. But here’s the challenge: you have to use as many words as possible that start with the letter you chose! Nouns, verbs, adjectives, people, places, descriptions, actions, and things – see how many words that start with your letter you can work into your story. It does not have to be a complete story (although it can be if you want), just get started and see where it goes. You might be surprised at the directions you go trying to use words that begin with your letter! Dogs were devoted. Dogs were delightful. In fact, they were downright dynamite! But dreams don’t die easily. She developed a dog dander destruction device. Delilah named her dog Daisy. Daisy is devoted. Daisy is delightful. In fact, Daisy is downright dynamite! And Daddy dotes on them doubly! Have fun with this! I can’t wait to see what you come up with – y’all amaze me every week! Oh Susanna – What’s The Difference Between A Query Letter And A Cover Letter And When To Use Which? Thanks, Romelle. And your baboon story, beautiful! Thank you, Susanna for not only affirming my writing, but for caring so much about every other entry which are absolutely awesome! I've also been taking advantage of Summer Short & Sweets by posting your challenge on my blog. I'm a little nervous as to what's coming next. George was a giant giraffe. He loved galloping across the green grasslands. The grayish water of the grand river greatly amused him. With his friends Ginger, Godwin, and Garrett, he was part of the Grazing Giraffes. Their grandparents gave them the nickname for they grazed the green grasslands constantly. I chose K. That was hard! I enjoyed using K words and hard C words to keep the K sound going. Of course K also makes the Nnn sound… Here it is! Kindly Kylie craves a kite. Knowing she’ll dream of kites tonight. Kites that catch the wind and cruise. Knitting clouds into a kiss. Kites that keel and start to roll. Kneeling Kylie holds the craft. Kites that lead us into town. Keeps Kind Kylie from dreaming more. Great, Jennifer! Gorgeous! Grand! So fun to see a new letter making it's way into the comments. I love your story about George and his grazing giraffe friends 🙂 Thanks for joining in the fun! OMG! Laura! This is amazing! I'm impressed. All those Ks, and a story, and RHYME. Wow! Thanks for joining the fun! Thank you, Susanna for not only affirming my writing, but for caring so much about every other entry which are absolutely awesome! 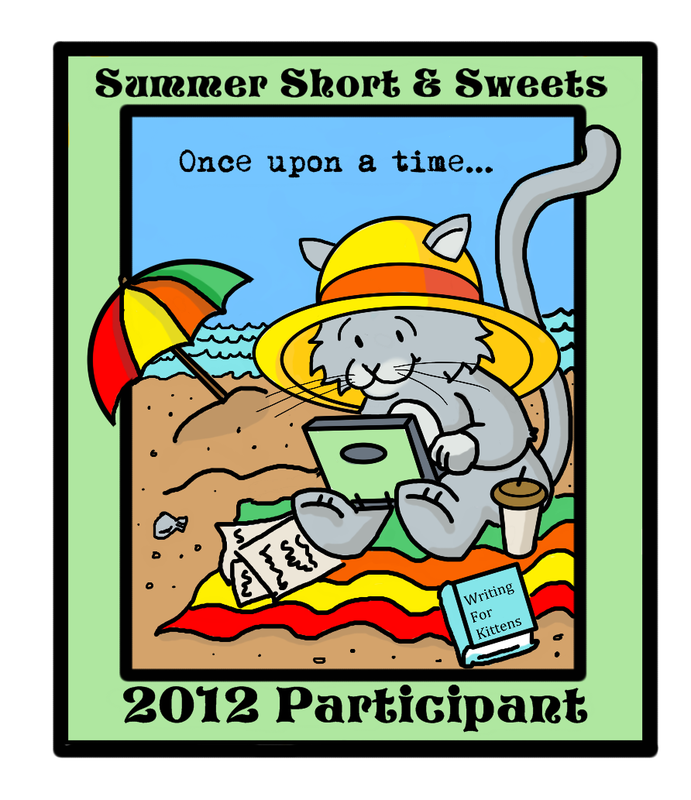 I've also been taking advantage of Summer Short & Sweets by posting your challenge on my blog. I'm a little nervous as to what's coming next. I hope no one has done “O” since I read through the last entries! Oscar Otter always hoped to go over the ocean to Oslo. Today was the big day. He opened his suitcase, and organized his odds and ends. He packed onions, okra, olives, oranges and oatmeal cookies. “Oh my, I almost forgot my oboe!” he exclaimed. Oscar added his top hat, planning to wear it at the opening gala at the opulent Oslo Opera House. “Oh Oscar!” called Olivia Ostrich, “Are you ready to head to the airport?” Olivia was his oldest friend, she she had offered to oversee his outing. “Much obliged,” Oscar answered, stepping out his door and onward to his adventure. Lollo loved licking lollipops. He’d lick lollipops all day long, until his tongue lolled out and turned a hundred colors. But no matter how many lollipops Lollo licked, he could not get enough. And so on, as a counting book perhaps. Not enough L's, but again, NO TIME this week. Love this exercise, though, Susanna – gave me lots of ideas! And by the way, your delightful doggy story and the dog dander destruction device is da bomb! Outstanding, Cathy! 🙂 And you were the first to do O 🙂 What an excellent job you did of telling a complete story with all those Os 🙂 Thanks for joining in the fun! LOVE this, Renee! LOTS of fun 🙂 And I know exactly how you feel about not enough time – I'm feeling more than frantic myself these days! 🙂 Good luck on your deadline! Here's my entry…”J” was tough! My husband was roped into helping me come up with Q words for this one so I should only get half of a point! Queen Quenby Quail was in a quandary. The day had become a quagmire of queer events; her quick quill quit working, her quince pie burned and her quaint quilt ripped right down the middle. “This qualifies as a quintessential disaster!” she quipped as a quartet of quarrelsome, quacking ducks disturbed the quiescent castle. After a quaff of tea, she set off on a quest to quell the quantity of chaos. Without a qualm she placed the castle under quarantine and enjoyed the resulting quiet. While wading in wiggly jello.